IT SEEMS hard to believe now but until this time last year, declaring yourself a “climate change sceptic” was a bit like admitting to being a banker or the kind of person who puts cats in dustbins for fun. As a long-time “denier” I remember it well: the heated rows; the sneery put-downs; the whispers that I’d joined the ranks of creation- ists, 9/11 “truthers” and David Icke-style conspiracy theorists who believe the world is secretly controlled by a lizard-headed master race. But then, a year ago today, all that changed. Suddenly it became clear that the so-called “science” of man-made global warming wasn’t nearly as “settled” as Al Gore claimed; many more of us began to realise that the real danger to our planet had less to do with polar bears on melting ice floes than with all the crazed, expensive government initiatives designed to stop climate changing in the way it has done quite naturally for the past several million years. And the reason was a news event called Climategate. In bare detail, Climategate sounds quite dull: the leak, on to the internet, of a large number of emails from the Climatic Research Unit (CRU) at the University of East Anglia. The threat to tropical rainforests from climate change may have been exaggerated by environmentalists, according to a new study. Researchers have shown that the world's tropical forests thrived in the far distant past when temperatures were 3 to 5C warmer than today. They believe that a wetter, warmer future may actually boost plants and animals living the tropics. The findings, published in the respected journal Science, come from a study of pollen trapped in rocks during a natural period of global warming 56.3million years ago. The extreme warm spell - called the Paleocene-Eocene Thermal Maximum - saw global temperatures soar by 6C (11F) within a few thousand years. The cause of the PETM is unknown. However, some scientists believe it was triggered by the release of vast amounts of carbon dioxide from volcanic activity over a few thousand years. The injection of carbon dioxide into the atmosphere set off a spiral of events that warmed the climate and led to even more greenhouse gas entering the atmosphere, they say. Times Daily, 11 Sep, 1972: "Expert Claims Ice Age Creeping Up"
Will this newspaper snippet from the Times Daily, dated the 11 Sept, 1972, start another "New Zealand Climate Scam"? Thanks to the blog, TheHockeySctick, we can see the full newspaper article The site then went on to plot a graph using the current data for the 1952-1972 period, and guess what, the trend was UP and NOT down. 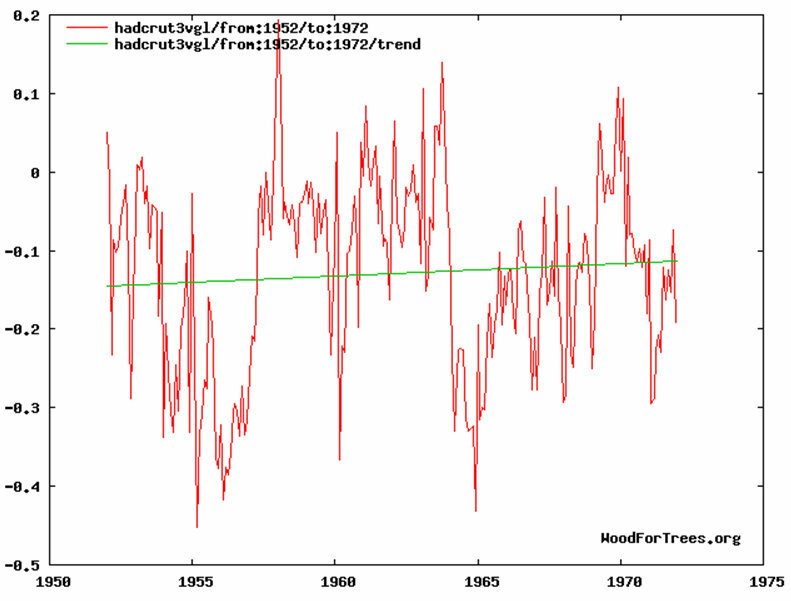 Did the Met Office use a different branch of climate mathematical analysis in 1972, or has the data been corrupted? And why did the Head Of The Met Office at the time put forward that the SUN as being resposible for the changes in our climate, and yet this rather important issue is NOT on the Met Office radar as of today? Click source to read what could be the start of the "Met Office Climate Scam"
Outspoken airline chief says climate change is a plot by scientists seeking research cash. Charging for toilets, weighing passengers and flying with a lone pilot: Ryanair's combative boss Michael O'Leary is renowned for backing unusual ideas, but some passengers may feel that even he has overstepped the mark with his latest comments – denying the existence of global warming. In an interview with The Independent littered with expletives, the chief executive of Europe's largest airline branded the scientific consensus that man-made pollution is heating up the planet with potentially grave consequences for the future of humanity as "horseshit". He agreed the climate was changing but denied it was caused by man-made emissions of carbon dioxide, such as those from his planes. "Nobody can argue that there isn't climate change. The climate's been changing since time immemorial," he said. Prince Charles launched a fierce attack on climate change sceptics yesterday, accusing them of peddling 'pseudo science'. The Prince of Wales said those who question whether human activity is causing global warming and climate change are intimidating governments into not 'adopting the precautionary measures necessary to avert environmental collapse'. Those who have expressed doubts include former Conservative chancellor Lord Lawson and environmentalist and broadcaster David Bellamy. Just three years ago the politics of global warming was enjoying its golden moment. The release in 2006 of Al Gore’s Oscar-winning film, An Inconvenient Truth, had riveted global audiences with its predictions of New York and Miami under 20 feet of water. Within 12 months, leading politicians with real power were on board. Germany’s Angela Merkel, dubbed the “climate chancellor” by her country’s press, arranged a Greenland photo op with a melting iceberg and promised to cut Europe’s emissions by 20 percent by 2020. British Prime Minister Tony Blair, who called climate change a scourge equal to fascism, offered 60 percent by 2050. In December 2007, the world got its very first green leader. Harnessing the issue of climate change, Kevin Rudd became prime minister of Australia, ready to take on what he called “the biggest political, economic, and moral challenge of our times.” Now, almost everywhere, green politics has fallen from its lofty heights. Following two of the harshest winters on record in the Northern Hemisphere—not to mention an epic economic crisis—voters no longer consider global warming a priority. Just 42 percent of Germans now worry about climate change, down from 62 percent in 2006. In Australia, only 53 percent still consider it a pressing issue, down from 75 percent in 2007. Americans rank climate change dead last of 21 problems that concern them most, according to a January Pew poll. Last month Canada’s Prime Minister Stephen Harper, blasting climate change as a “sideshow” to global economic issues, canceled the meeting of environment ministers that has preceded the G8 or G20 summit every year but one since 1994. Merkel has slashed green-development aid in the latest round of budget cuts, while in Washington, Barack Obama seems to have cooled on his plan to cap emissions. In perhaps the most striking momentum reversal for environmental politicians, last month Rudd became the first leader to be destroyed by his green policies. Flip-flopping over planned emissions cuts as the opposition exploited Australian voters’ flagging support for climate measures, he was finally ousted by party rebels. AT Easter, the official Greenpeace website carried a blog written by Gene Hashmi, communications director of its affiliate in India. Hashmi pointed his finger at sceptics who fuelled "spurious debates around false solutions" and concluded with the not too subtle threat: "We know who you are. We know where you live. We know where you work. And we be many but you be few." Fearing a backlash to a statement that most normal readers would interpret as an incitement to violence, Greenpeace pulled the blog from its site. It defensively justified its act of self-censorship on the ground that it was very "easy to misconstrue" the statement. Stating that the IPCC will make efforts to ensure that its fifth assessment report carries no errors, its chairman R K Pachauri has ruled out stepping down even if the UN-constituted review committee finds faults in the procedures followed by the climate panel. "Certainly not. But we will certainly implement any constructive recommendations that we get. As matter of fact, I would be responsible for implementing the recommendations. How can I walk away from that?" Pachauri said. He was asked whether he would consider stepping down if the UN-constituted Inter-Academic Council review was to come to the conclusion that procedures have not been followed. Accepting moral responsibility for the error in the fourth assessment report which had claimed that the Himalayan glaciers would melt by 2035, Pachauri said he also accepts the responsibility placed on him by the world governments by electing him as Chairman of the Intergovernmental Panel on Climate Change (IIPC). Is climate change a serious threat to humanity or a scam trumped up by agenda-minded activists? Even the nation's TV weathercasters can't agree on that scientific dilemma, according to the largest survey of the profession to date released Monday by George Mason University's Center for Climate Change Communication. The majority — 63 percent — say global warming is caused "mostly by natural changes in the environment" compared with 31 percent who blamed the phenomenon on "human activities." More than a quarter said they agreed that the phenomenon is "a scam." Another 48 percent said global warming should be a "low" priority for President Obama and Congress; one out of three felt is should be given "medium" priority; 23 percent felt is was of "high" importance. The group is well aware of dissent in the research community as well: Sixty-one percent said there is "a lot of disagreement among scientists" about the issue. But should climate change and global warming be a subject for their own broadcast coverage? Two-thirds said yes — though three-fourths also felt the subject was better suited for online discussions, "as many report concern about audience 'backlash,'" the survey said. Some prominent weathermen, however, are not buying into the theory. LONDON -- Apocalyptic visions and the muscular language of religious fervor are invading the climate arena, replacing issues of fact with those of faith and bringing high emotion into science -- an area where it should have no place -- politicians and religious leaders complain. People who say human-induced climate change is a fact that demands urgent action are described as "believers" or "climate evangelists," while those who reject the concept are "deniers," "skeptics" or "atheists." Those in the middle who say they are unconvinced either way are "agnostics." "The use of this language has become increasingly an issue," said Colin Challen, chairman of the United Kingdom's All Party Parliamentary Climate Change Group, a committee of U.K. lawmakers studying the global climate phenomenon. "Some people would like that to happen, because in some eyes proving that climate change is man-made becomes as difficult as proving the existence of God," he told E&E.